Those 20- to 40-foot corrugated steel containers, a much stronger and more permanent alternative to weaker manufactured homes, are built to withstand stacking and shipping through hell and, well, high water. They are impervious to hurricanes and robust enough to remain standing in all but the worst earthquakes. 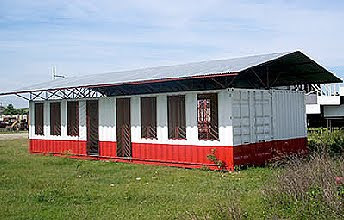 Deadline Newsroom - The surplus of steel cargo shipping containers is an immediate answer to Haiti's sudden housing shortage. Turning the containers into housing will also put residents of the island nation to work. The island country, like other Caribbean nations, imports more than it exports and that leaves a surplus of empty containers languishing on their docks. So when retired Georgia Tech building construction and industrial design professor Richard Martin recently saw photos of the containers unscathed and toppled and floating in the sea after Haiti's Jan. 12 quake, he renewed thoughts about their potential use. "We can do something quickly. We can go down there and help rebuild the country and get the involvement of the Haitians. I won't do anything without Haitian workers working with me," says Martin, who operates Atlanta, GA-based Global Container Partnerships. Bill Clinton, George Bush call Martin at 1.770.952.1604. I think these cargo homes are perfect for them. Coz they give them an urgent shelter.